Author(s): Muhamad Bata, Department of Animal Production, Faculty of Animal Science, Jenderal Soedirman University, Purwokerto, P.O. Box: 0000-110, Indonesia	Sri Rahayua. Background: In this research, we investigated which bioactive substances are found in Hibiscus tiliaceus and whether they might make this plant a suitable additive to ruminant feed. The substances investigated include saponin, fumaric acid, and flavonoids. It is possible that these additives could minimise methane emission, and improve the growth performance of indigenous cattle. Methods: We evaluated the nutrient contents of extracts of H. tiliaceus, including crude protein, crude fibre, amino acids, fumaric acid, and active compounds. We extracted large and small leaves and small flowers from H. tiliaceus using various types and concentrations of solvents. The solvents used were water, ethanol, ethyl acetate, and ethyl ether. Results: We found more flavonoids and phenols in samples extracted with ethyl acetate than with the other solvents. In the case of the ethyl acetate solvent, the highest concentrations of both flavonoids and phenols were found in the small leaves rather than the large leaves. The fumaric acid content was higher in the small leaves than in the flower (48.18 vs. 35.47 ppm). The saponin content of the small leaves when dissolved in ethyl acetate and ethyl ether was higher than when water or ethanol were used as the solvent (24.6 and 32.0% vs. 3.0 and 1.2%, respectively). In the case of the small flowers, the highest saponin concentration was found in the extracts in water and ethanol (15.0 and 8.05% vs. 0.14 and 5.5%). We found higher concentrations of amino acids, protein, and low crude fibre in the small leaves. The fumaric acid content of the small leaves was higher than that of the small flowers. There were 24 organic compounds in the aqueous extracts of leaves. These mainly consisted of fatty acids and ester (31%), nitrogenous compounds (18.28%), and quinoline (23%). 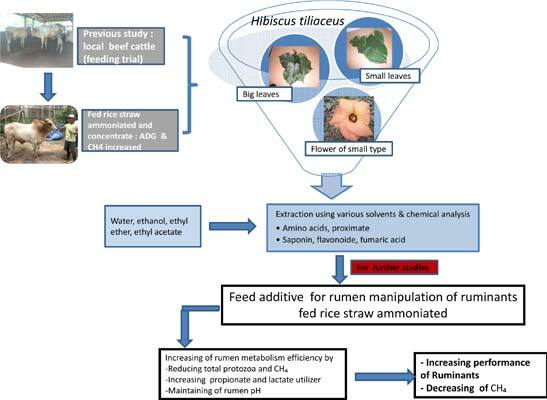 Conclusion: The leaves and flowers of small varieties of H. tiliaceus can potentially be used as feed additives to manipulate rumen conditions, improve feed efficiency, and reduce methane emissions. Keywords: Hibiscus tiliaceus, saponin, flavonoid, methane, rumen. Keywords:Hibiscus tiliaceus, saponin, flavonoid, methane, rumen. Abstract:Background: In this research, we investigated which bioactive substances are found in Hibiscus tiliaceus and whether they might make this plant a suitable additive to ruminant feed. The substances investigated include saponin, fumaric acid, and flavonoids. It is possible that these additives could minimise methane emission, and improve the growth performance of indigenous cattle.